Little girl with round rosy cheeks and soft brown curls, bouncing from person to person, giggling with great delight. The sparkle in her eyes reflecting the glittery balloons and silver tulle ribbons scattered about the room. Tall male cousins duck to avoid the colorful paper snowflakes swirling overhead and eager fingers fill white plates with sandwich roll-ups, plump strawberries and squares of cheese. Purple cups of fizzy blue punch with foaming flecks of white ice cream pass from hand to hand. Steamy hot water pours over chocolate powder, swirling to the top of the mugs to be sprinkled with chocolate morsels and whipped cream. 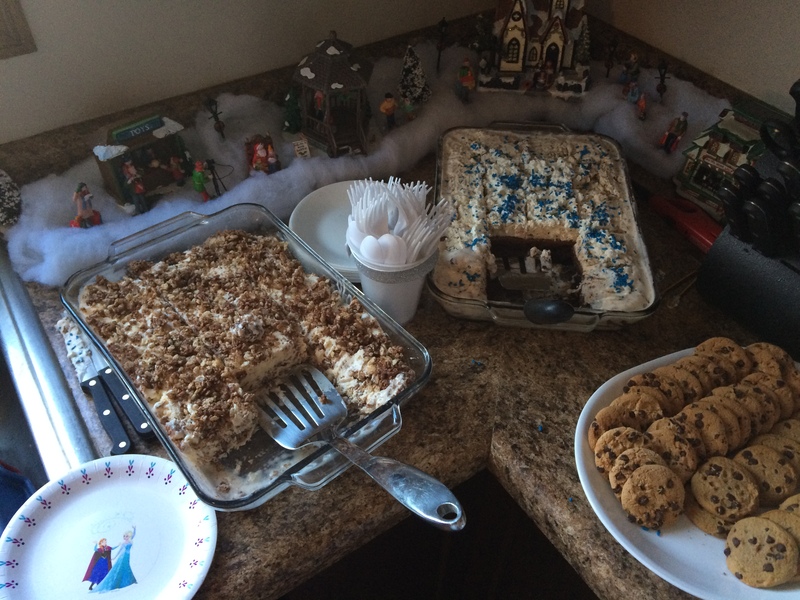 The frozen cakes are brought out and three gold candles lit amidst blue sprinkles and a miniature Olaf snowman. 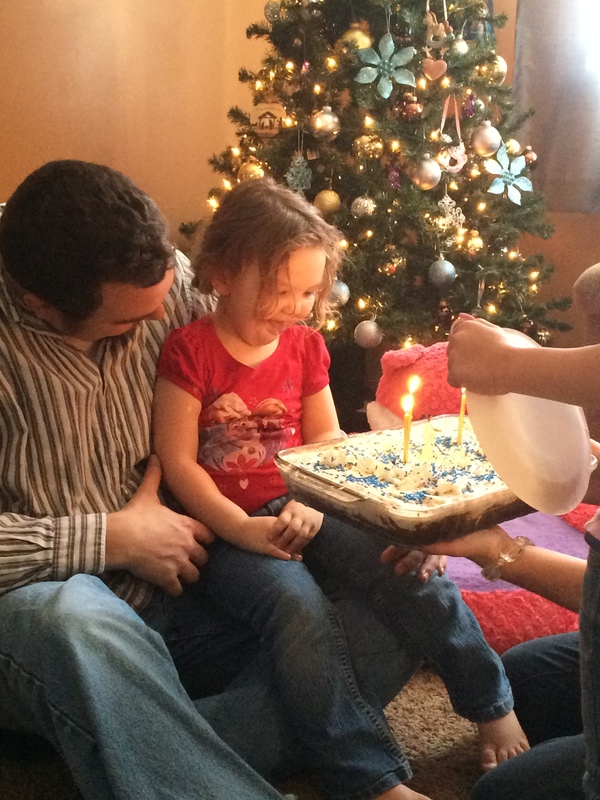 The familiar “Happy Birthday” chorus resounds throughout the living room and before the last note is even finished, she is leaning in to blow out the candles one at a time. One. Two. Three. 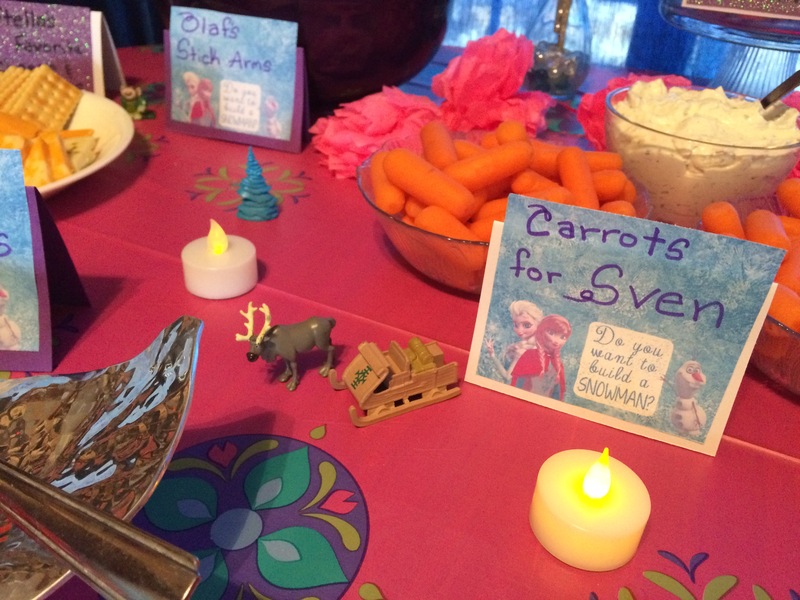 It was a magical day and so much fun for a winter birthday party theme and for a little girl who loves princesses and Frozen! I got most of my ideas from Pinterest and I used my party planning checklist to organize all the details. 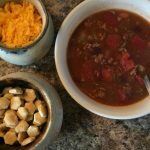 It really helped me to plan ahead and make sure I remembered everything from when and how I was going to decorate to the number of toppings I needed to buy for the hot chocolate bar. You can check out my Pinterest board for my source of inspiration for these themed parties. I purchased this super cheap pack from Amazon that came with envelopes for the invitations. The thank you notes were actually post cards but I have extra white envelopes at home so I sent them that way. 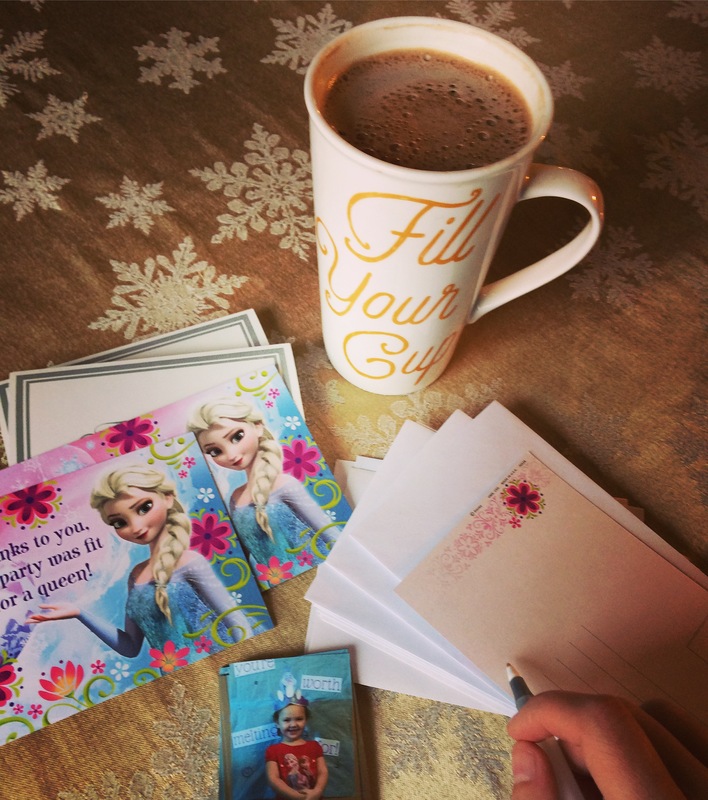 When we have a birthday party, opening presents gets a little hectic but I try to keep track of who gave what so I can make a thank you note list and send personalized thank you messages after the party. I printed wallet-sized pictures of the birthday girl to send along with each thank you note. 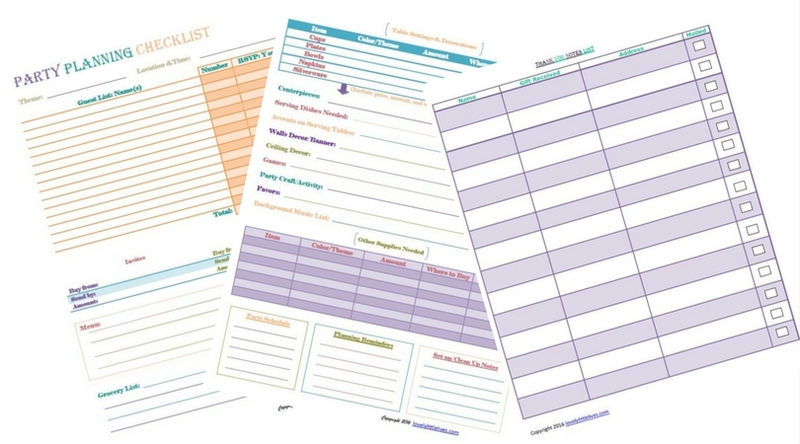 The party planning checklist includes a bonus sheet for recording a thank you note list. 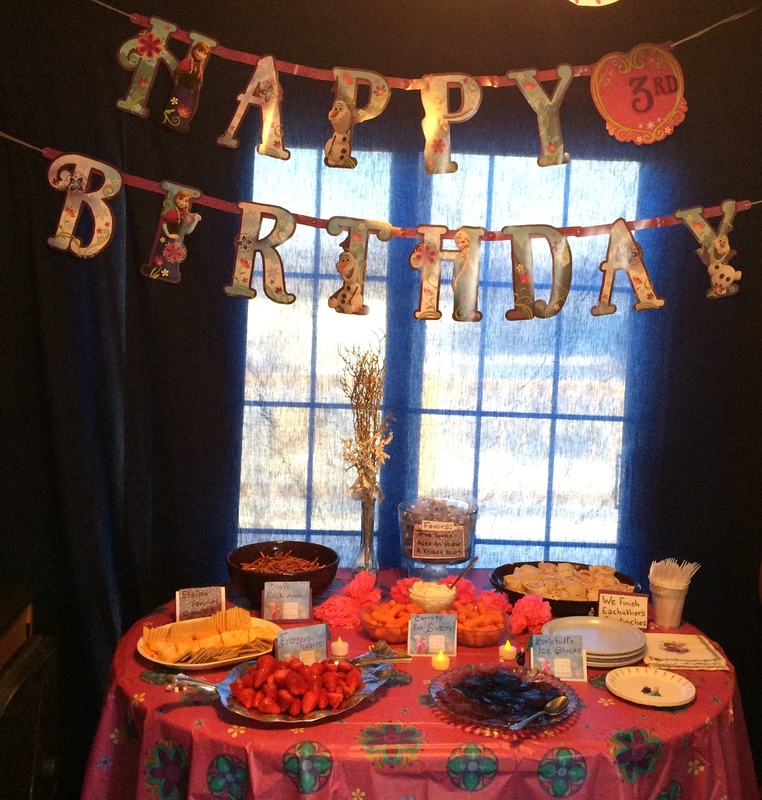 I planned out this party over a few months and put together the decorations during the two weeks before the party. 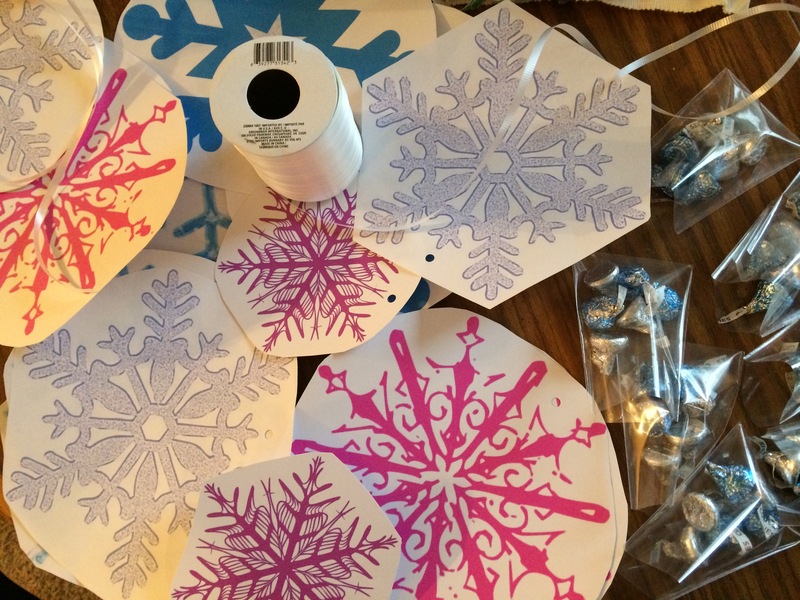 I printed out snowflake images on white card stock, punched a hole in each piece and hung from the ceiling with ribbon and thumb tacks. 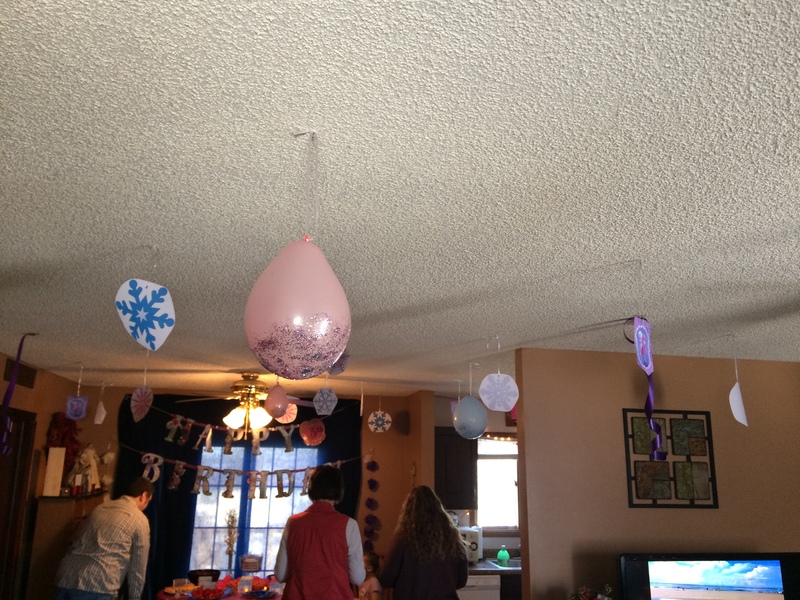 I blew up blue and pink balloons, used Modge Podge and loose glitter on the bottom of the balloon and I hung those with ribbon too. 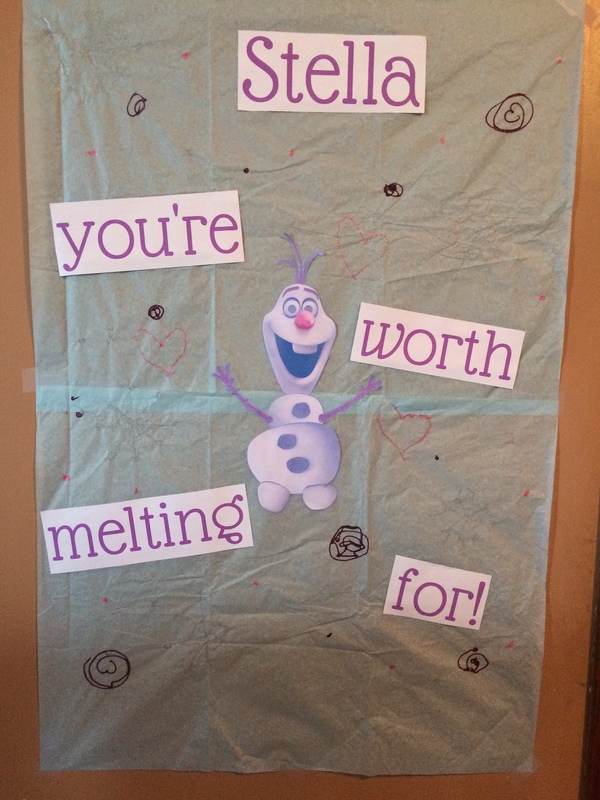 I found a Frozen birthday banner at a garage sale last year and had been saving it for this party. I used a dark blue sheet to create the backdrop with thumb tasks and heavy clear tape. 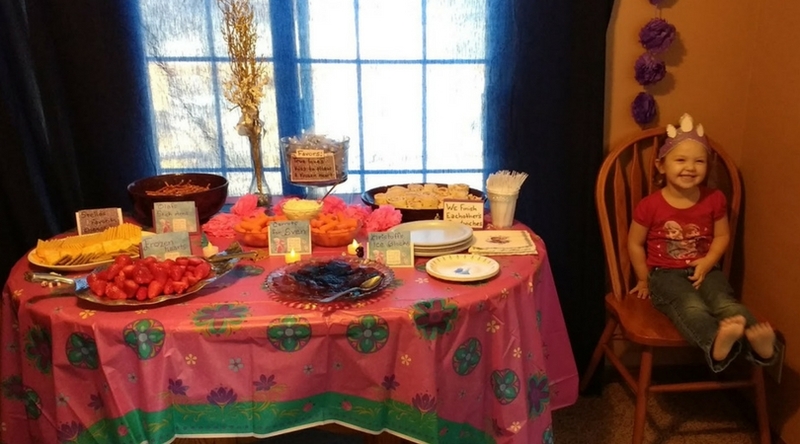 The tablecloth was a frozen themed one from Party City. The vases with gold and white glitter sprigs were items I already had on hand and I used them to decorate the tables where guests could sit to eat. The tea lights, snowflakes, pebbles and ribbons scattered on the tables were a mixture of items I had already. The snowflakes were from Walgreens and the tea lights were from Amazon. 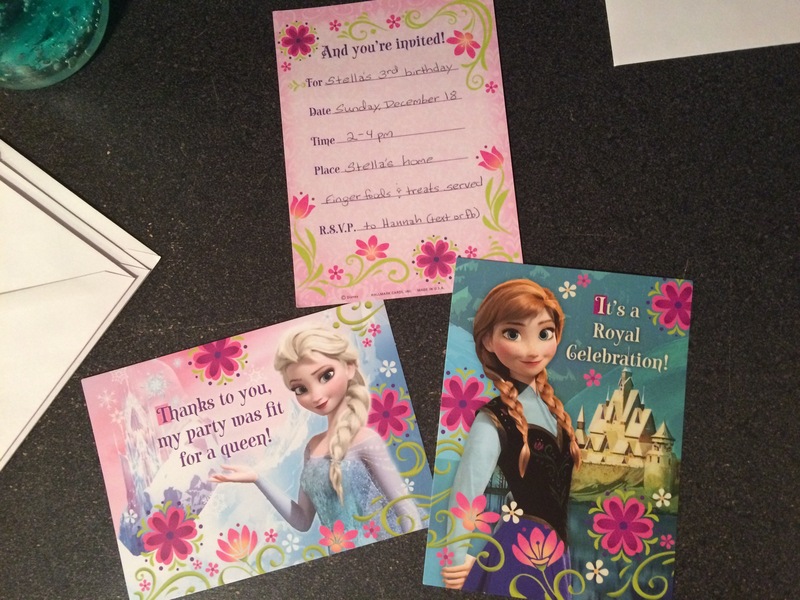 They were left over from our Tangled birthday party we had in the summer. I took ideas from Pinterest and created an array of finger foods that were themed to the movie, each dish received a mini sign to explain how it fit with the theme. 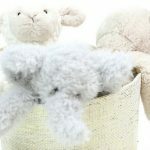 Of course, if you haven’t seen the movie, it doesn’t make much sense, but if you have seen the movie, most of these should be recognizable connections. Cheese and cracker tray -“Stella’s Favorite” (This was not from the movie but was inspired by the birthday girl who loves cheese and crackers). 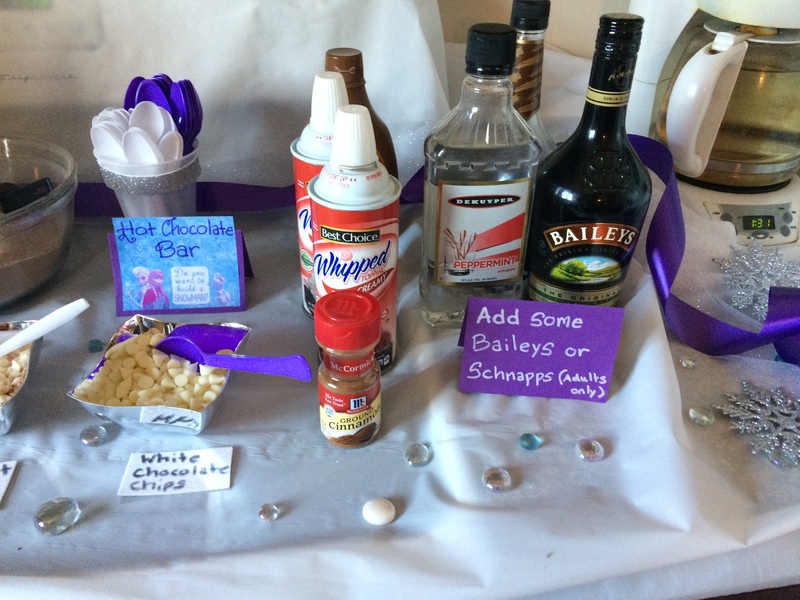 I made these little signs to go with the food and drinks by cutting squares out of white and purple construction paper and then gluing squares of purple and white glitter foam (from Hobby Lobby) on top. 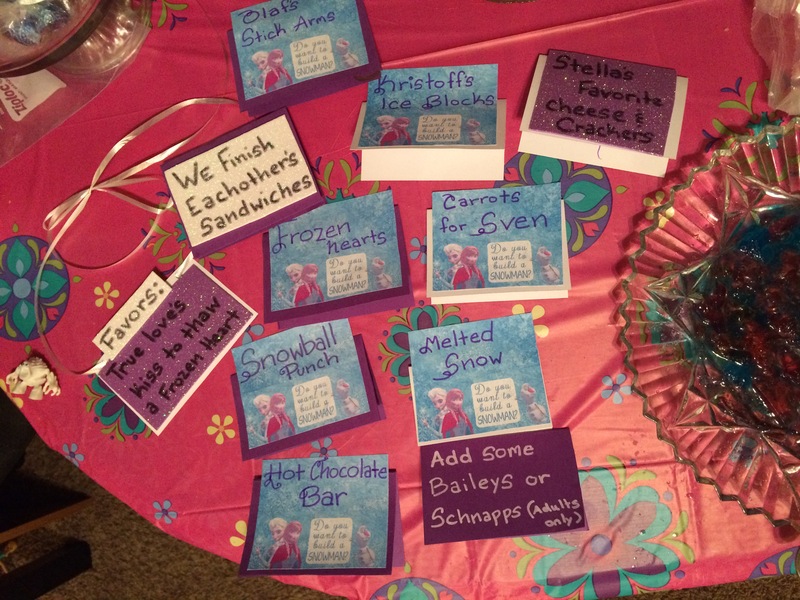 The blue Frozen charter signs were a free printable from I watch them grow which I originally got to make build a snowman favor kits but then decided to use them for this purpose instead. 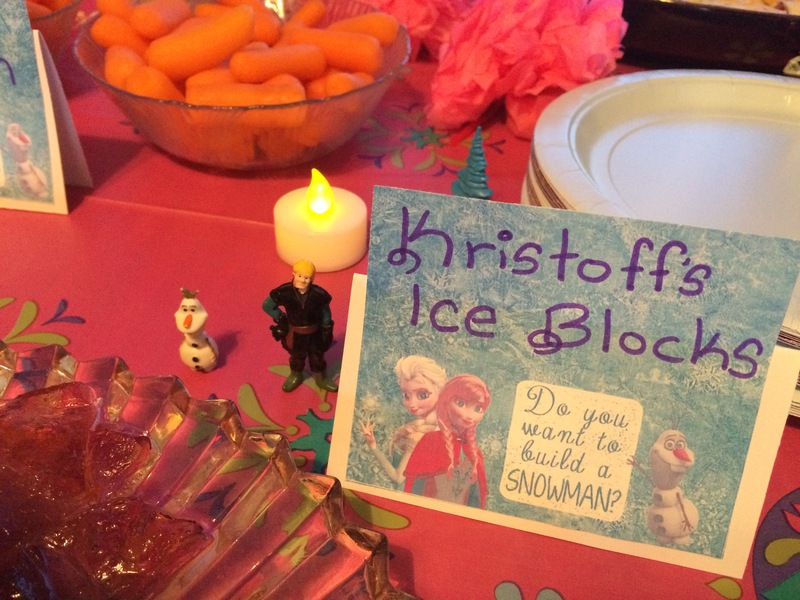 I placed little Frozen figurines by around the table by the signs that matched each character. 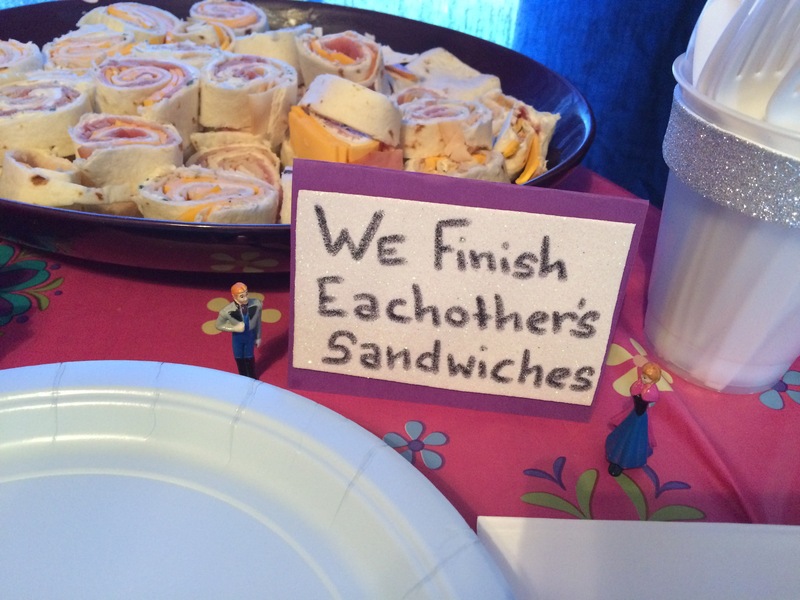 For instance, Anna and Hans stood next to “we finish each other’s sandwiches” sign because that is a line they sing to each other. For the drinks I had a pitcher of ice water with the sign “melted snow”. 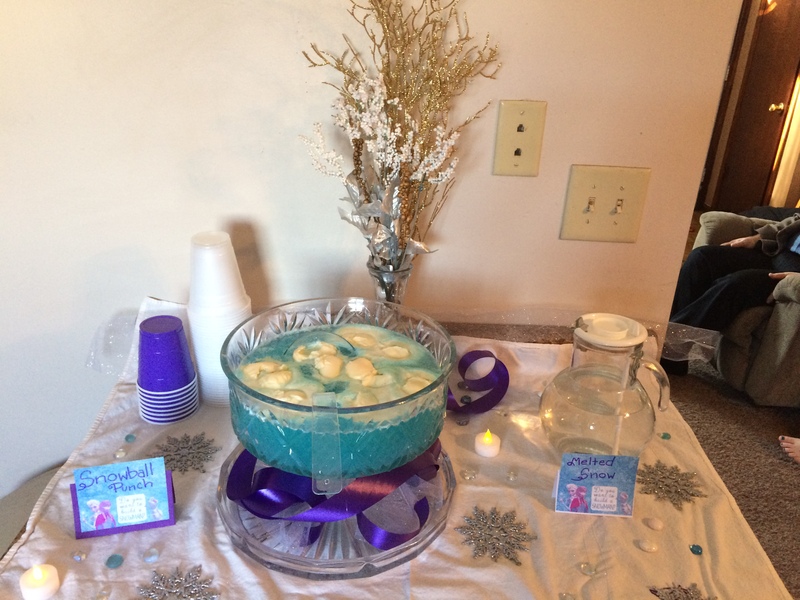 A snowball party punch from The Frugal Girls which was a huge hit, and a hot chocolate bar. 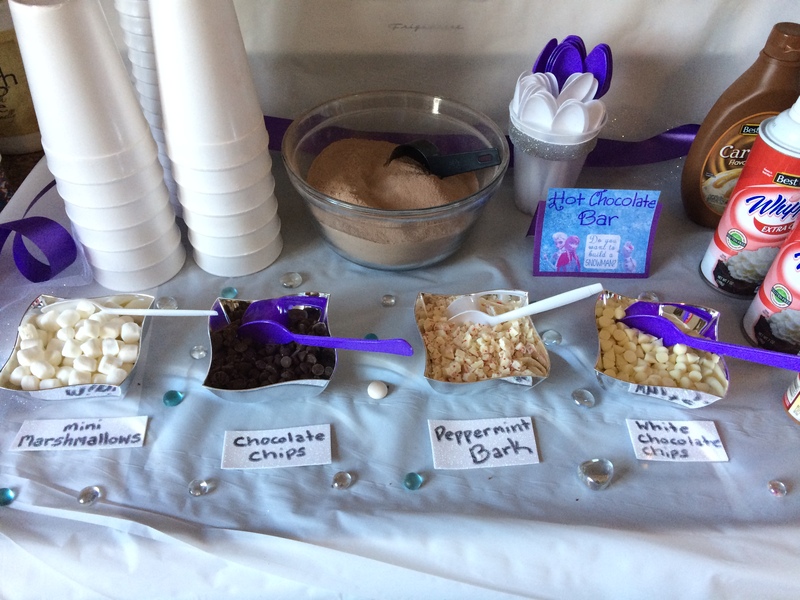 For the hot chocolate bar, I had hot water ready in the coffee pot, and hot chocolate mix in a bowl with a measuring cup to scoop with and a variety of options for toppings. 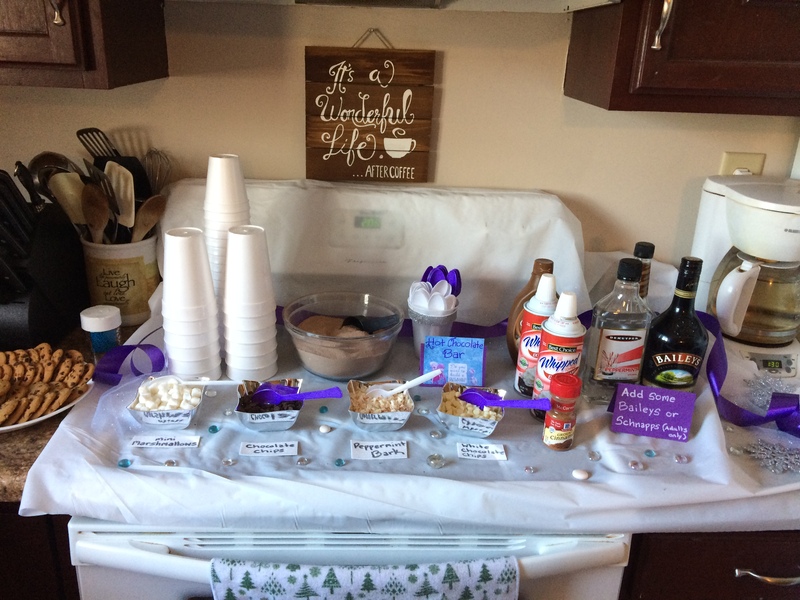 There was Reddi whipped cream, caramel syrup, cinnamon, mini marshmallows, chocolate chips, peppermint barks pieces, white chocolate chips for everyone and some peppermint schnapps, Irish cream baileys and coffee liquor for the adults to mix in. For the spoon holder, I used a clear plastic cup and decorated with a strip of glitter foam. The silver serving dishes were from the dollar store. Oh and if you are wondering about the awesome wooden sign above the hot chocolate bar, that was given to me at Christmas from my good friend at Kassondra Design. 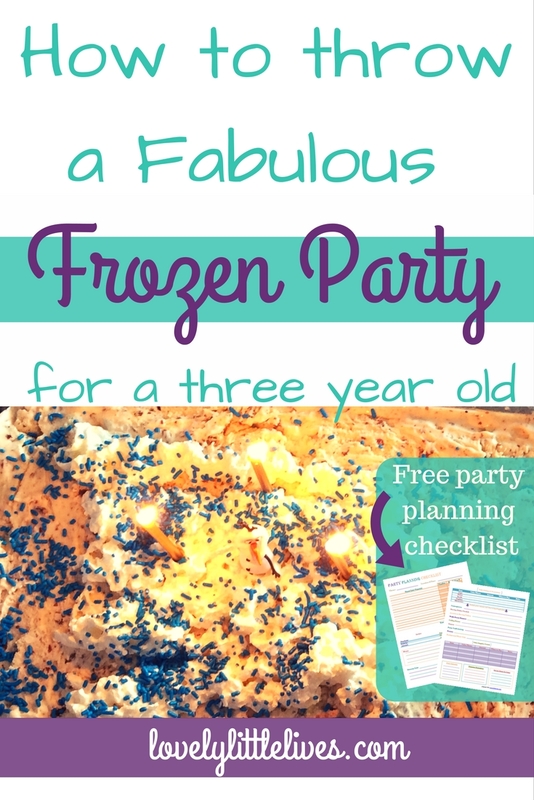 I choose to make ice cream cakes because of course, you need frozen cakes at a Frozen birthday party. 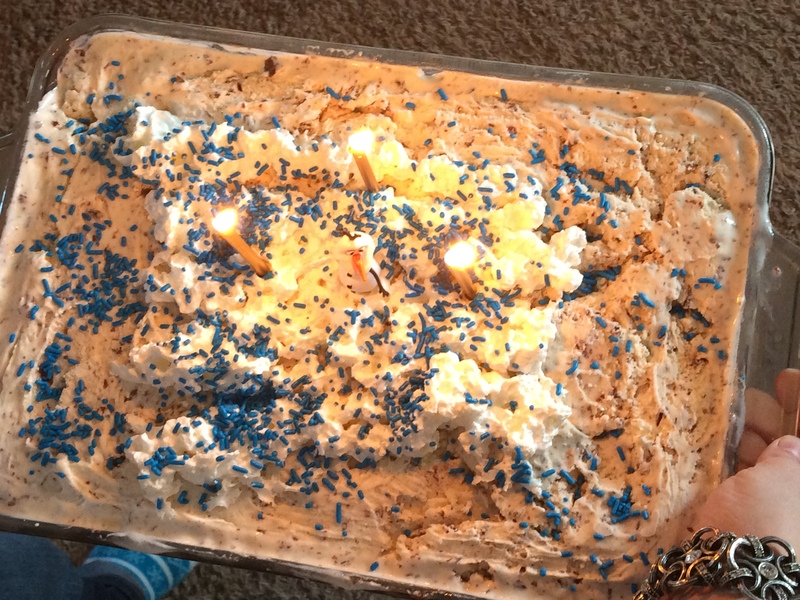 I made a brownie ice cream cake following this recipe and added an Olaf figurine amid whipped cream, blue sprinkles and three gold candles. 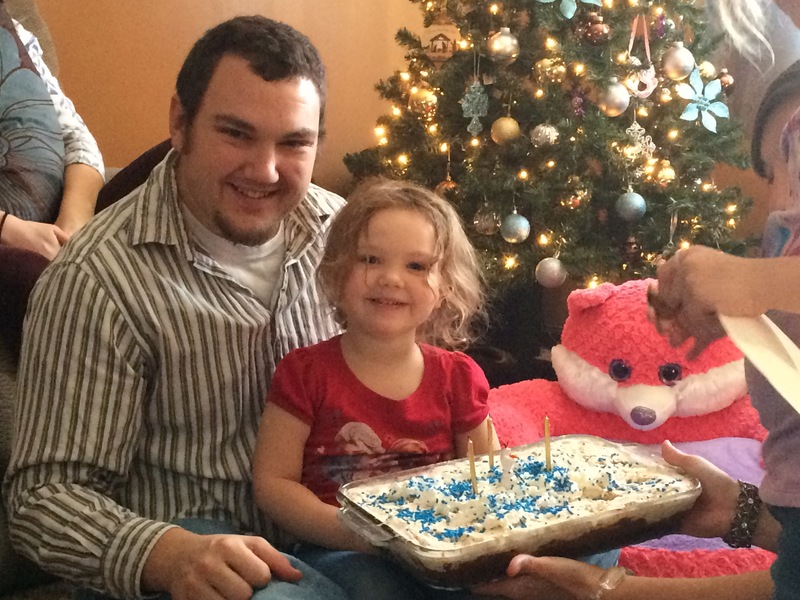 The birthday girl was very happy with the brownie cake. I also made a Nutella crunch cake which was a favorite with the adults. I made a double recipe which results in two 13-by-9-inch pans. 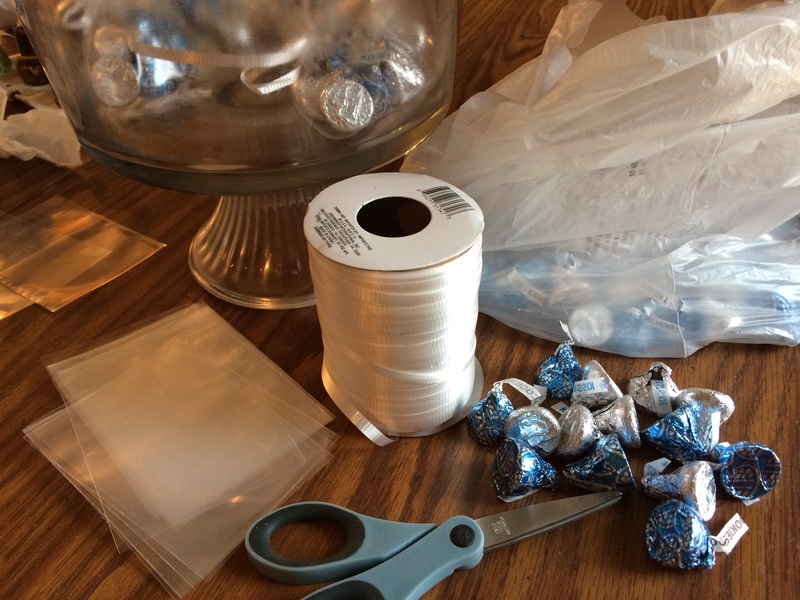 For favors, I bought blue and silver wrapped chocolate kisses from Party City, which were crazy cheap by the way, and then wrapped them in little favor bags from Walmart with ribbon. 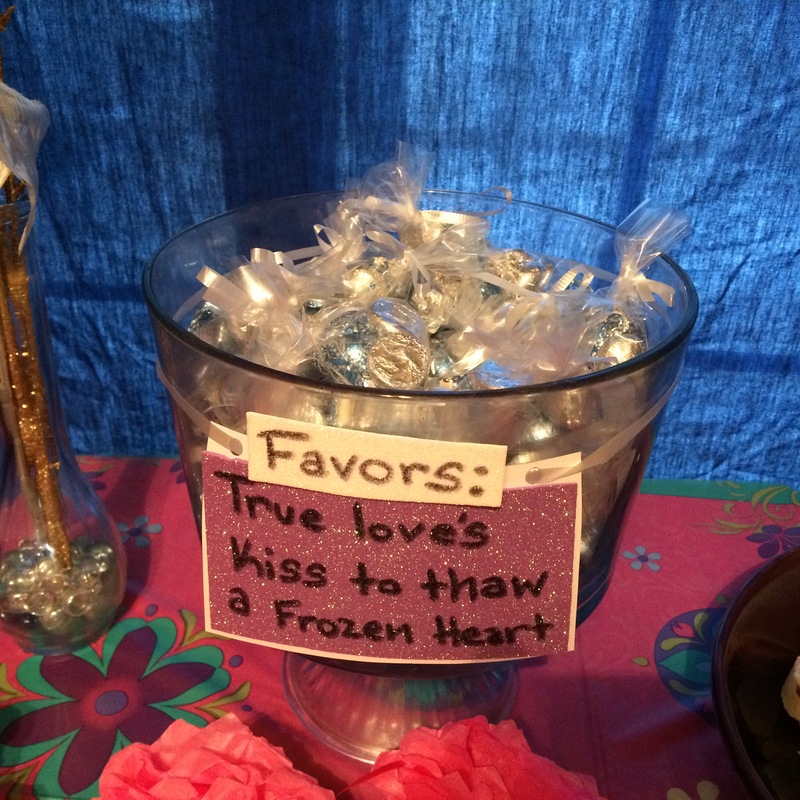 I used a trifle glass bowl to display them complete with a sign that played off a theme in the movie: “True love’s kiss to thaw a frozen heart”. 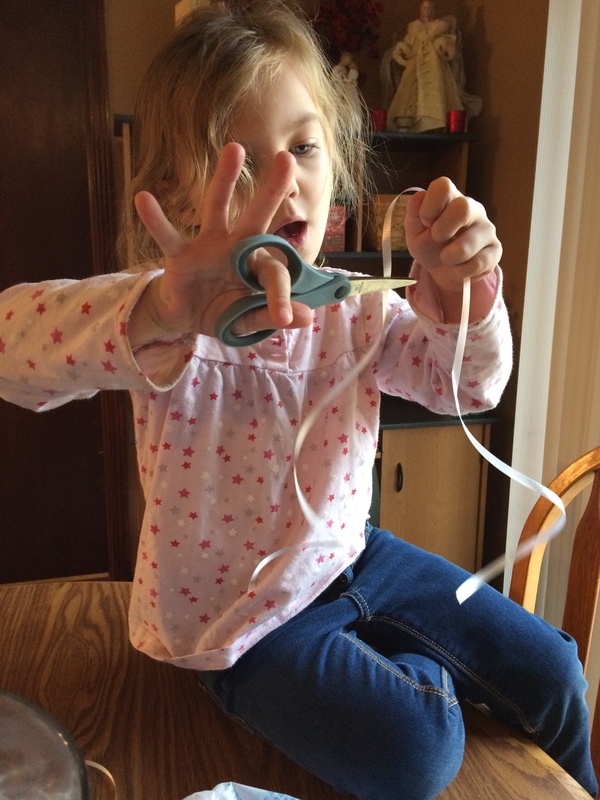 I had help from my four year old who is learning how to cut with scissors. It was a blast of an afternoon, complete with the Frozen soundtrack playing in the background and a very giggly birthday girl who recovered beautifully from the tantrum she had right before her party guests arrived. The story of real life with a three-year-old. She was the princess of the hour and said “thank you” to everyone right after we say “Happy Birthday”. She and her sister both worth Frozen shirts and had “Elsa” and “Anna” braids arranged by their aunties while I was finishing last minute party prep. Stella also wore a princess crown (for part of the day) that I had fashioned from glitter foam using this pattern as a reference. 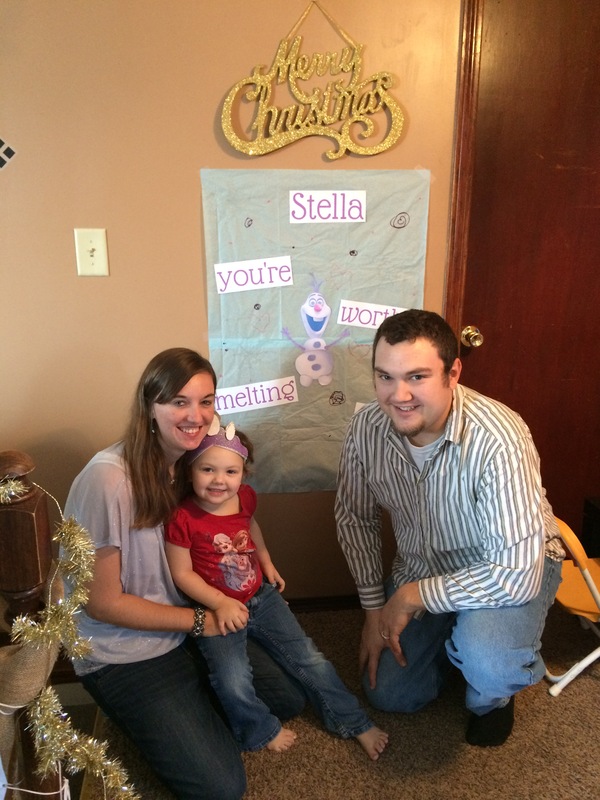 It’s safe to say she had a magical 3rd birthday! If you want your little one to have an epic birthday party and hopefully wear a smile as big as this, you can use my free checklist to plan out the perfect themed day down to the last detail. Let me know if you have any questions, I would be more than happy to help! That is all so cute! 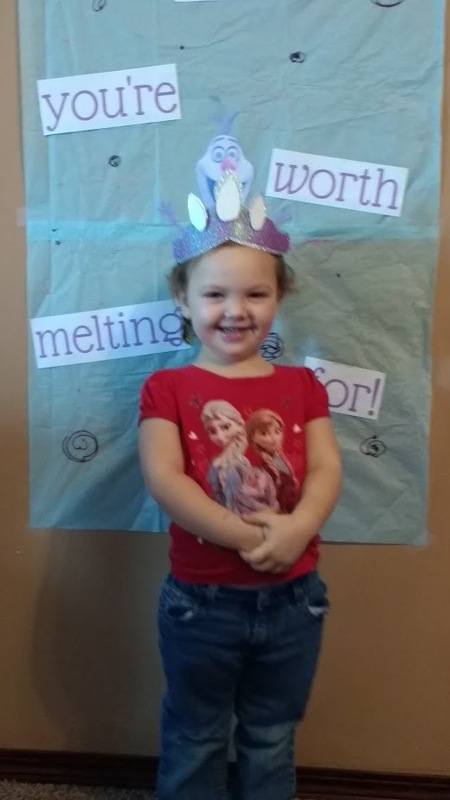 We love Frozen around here! And I love putting together super cute, yet super cheap themed parties, lol! 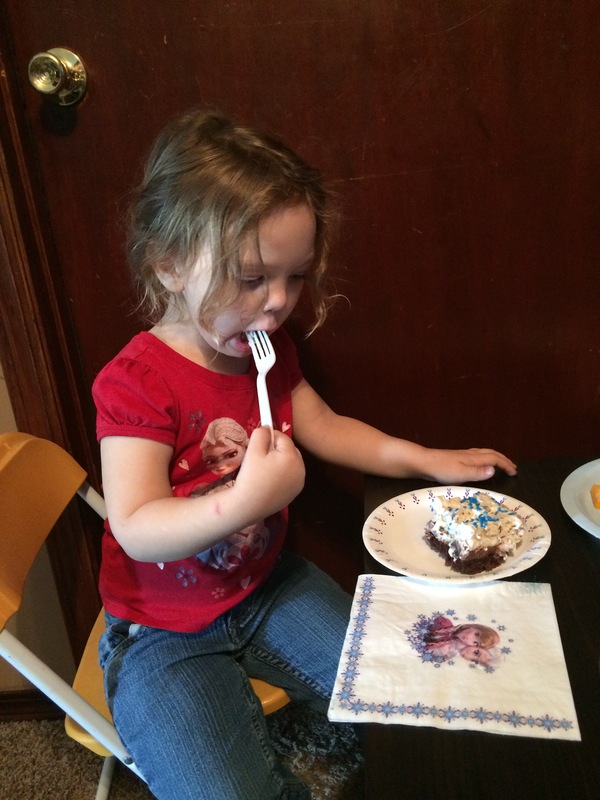 Your thank you note idea was a good one, with sending a little pic of the birthday girl! I am a sucker for a party with a theme! Your ideas are so clever…I just love this! Pinning! Thank you 🙂 It’s all pinterest inspired. This is seriously the cutest thing ever. The food alone is awesome – I want that punch. 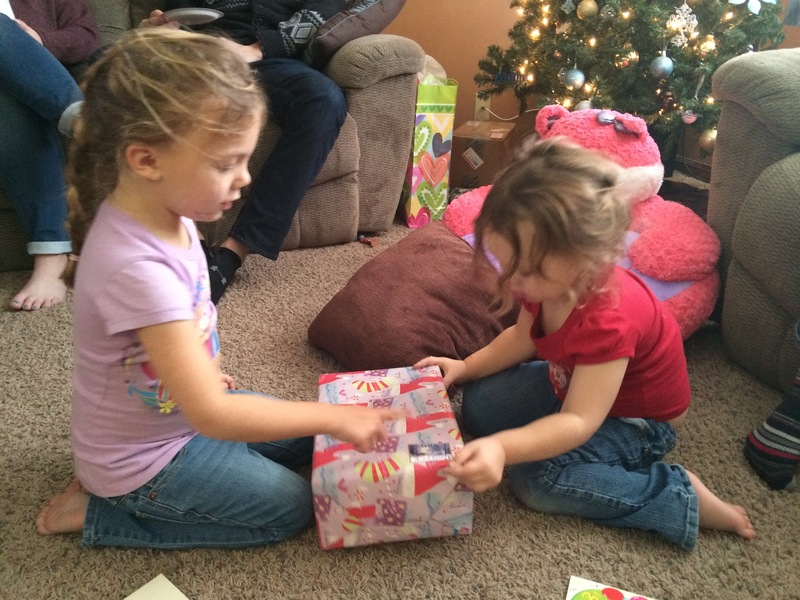 Good going – thanks for sharing!!! I’m totally inspired now. It’s a lot of work but it’s so worth it in the end.